The 11th annual Bollywood Film Festival focuses on the women who work in front of and behind the camera in the world's largest film industry. The hottest song-and-dance Bollywood extravaganzas screen along with indie films that shine a light on issues Indian women face today. Don't miss a night of live performance by Aaja Nachle Hawaii. We kick the festival iffwith a bang! 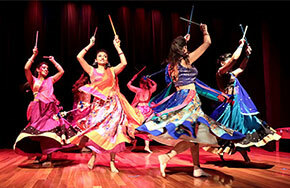 Dance and sing with classic Bollywood tracks and live performances by Aaja Nachle Hawaii. Complimentary mehndi provided by Hauoli Henna and Touch of Henna Hawaii. Enjoy an Indian buffet by Bombay Palace with wine, beer, and soda available for purchase. Bareilly Ki Barfi screens at 7:30pm. Special offer: Present any event ticket from the Bollywood Film Festival 2018 to Ravish restaurant at THE MODERN HONOLULU and receive a free dessert. Offer valid thru festival dates, January 13-26, 2018. Related events: This month, celebrate Indian culture through art, music, and dance during Bank of Hawaii Family Sunday: Whirls and Swirls and ARTafterDARK: Kiss Kiss Bang Bhangra!